Great Jeep Grand Cherokee car Leasing & Contract Hire Deals. Our Jeep Grand Cherokee Lease Deals. Progress. It isn't always welcome but sometimes it's necessary. It's what's created this improved fifth generation Jeep Cherokee, a car that's simply had to evolve under the twin pressures of very different brand ownership and market demand. Long time Cherokee owners unfamiliar with the unusual looks will also be unfamiliar with the tarmac-orientated driving experience. Still, there aren't many people like that still about and the new brand converts Jeep is hoping to target will find this car easier to adjust to than any model it's made to date. Jeep offers two Fiat-derived diesel engine choices, plus a rare 3.2-litre petrol V6 for top 'Trailhawk' variants. These options continue, but have been joined in this revised model range by an all-new 2.0-litre direct injection turbocharged inline four cylinder unit. Most likely customers though, will continue to concentrate on the diesel range, where entry-level buyers get a 140bhp 2.0-litre MultiJet unit with a six-speed manual box and a choice of either 2WD or 4WD set-ups. Offered only with 4WD is the preferable and more modern 2.2-litre MultiJet powerplant, available only with a 9-speed auto gearbox. This engine comes in either 185bhp or 200bhp guises and offers a wide spread of torque from low rpm. The pokier version in basic 'Active Drive I' guise makes 62mph from rest in 8.5s en route to 127mph and develops 440Nm of torque. The Cherokee does still remain a slightly more capable choice than rivals in the RAV4 or CR-V soft roader class, though that's not really because of its standard 'Active Drive I' 4WD system: this simply shuttles torque from front to rear in response to slip, just as you'd find elsewhere in this segment. What makes this car a little more effective in the slush than the unremarkable class norm is the way this set-up combines with Jeep's clever 'Selec-Terrain' system - designed to be like having an off road expert sitting next to you as you drive. With a push of a button on the Selec-Terrain dial, you can choose between a series of customised settings to suit the ground you're travelling over. On standard versions, there's 'Snow' or 'Sand/Mud' options if you're offroad, a 'Sport' option for on-tarmac use and an 'Auto' setting if you can't be bothered to choose. For a car that could manage a bit more than that, you'd have to opt for Jeep's extra cost 'Active Drive II' 4WD system that adds a low range gearbox and Hill Descent Control to ease you down slippery slopes. 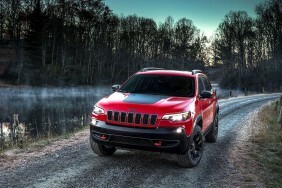 This revised fifth generation Cherokee features a series of exterior changes mainly focusing on the front end to bring it into line with the recently-launched Compass model. The bonnet, LED headlamps, daylight running lamps and fog lamps are all new. Even the classic seven-slot grille has been updated. In profile, there are fewer changes, so the traditional trapezoid wheel arch shapes remain, married to a low, sleek glasshouse. LED tail lights that seem to take a bite out of the rear window glass and a curvaceous tailgate that catches the eye at the back. As an option, buyers can also have a CommandView dual-pane power sunroof which extends from the windscreen to the rear of the vehicle. Cherokee interiors always used to be tough but uninspiring. Nowadays, dull colour schemes, cheap plastics and poor ergonomics just won't wash in a market where even the cheapest Korean SUVs feature soft-touch plastics, get serious budget spent on all the touch-points in the cabin and demonstrate a laudable attention to detail. Therefore the Cherokee has had to shape up. With this updated model, the interior receives a fresh and elegant touch with Satin Chrome and Piano Black high-gloss accents, while remaining practical and comfortable environment. As before, the centre stack bezel is inspired by the outline of the front grille of the 1940s Willys Jeep. The seats are available with a memory adjustable mechanism and heated/ventilated features for the front pair. The 60/40 split second-row seats adjust fore and aft for increased passenger leg room and cargo versatility. A top storage tray is located above the centre stack on top of the instrument panel and the front-passenger seat folds flat and offers hidden storage by flipping up the passenger seat cushion. Prices start at around £33,000 for the 2.0-litre Longitude 140 6-speed variant, rising to around £42,500 for the top V6 Trailhawk model. All versions are well equipped, coming complete with LED daytime running lights, LED tail lights, front foglamps that light your way around the bends, Jeep's handy 'ParkSense Rear Park Assist with Stop' sensor system, an alarm and 17-inch aluminium wheels, whose finish is matched on the window surrounds, grille, roof rails and exhaust tips. Inside there's automatic air-conditioning and electric front windows, along with a six-way adjustable driver's seat. That's on top of cruise control, a fold-flat front passenger seat and a leather-trimmed steering wheel with buttons for the 'Uconnect' infotainment system with its 6-speaker audio set-up. This includes USB and Bluetooth connectivity, plus an audio jack input point, a remote SD card slot and an integrated voice command set-up. You also get a useful 'Cargo Management System' in the boot with a removable grocery bag and a universal module rack to which you can attach all kinds of extra-cost Mopar accessories - things like a cargo bin and mat, a foldable cooler and a first aid & emergency kit. Standard safety features on the Cherokee consist of seven standard airbags (front seats multistage air bags, side bags, window bags, driver side knee air bag), Electronic Stability Control with rollover mitigation and anti-lock brakes with off-road calibration. There are also some advanced options like Forward Collision Warning-Plus, ParkSense Parallel and Perpendicular Park Assist, Adaptive Cruise Control-Plus, Lane Departure Warning-Plus, Blind Spot Monitoring and Rear Cross Path Detection. As a result, the Cherokee did enough to earn the 'best in class' safety designation from Euro NCAP in the Small Off-road 4X4 category in 2013.